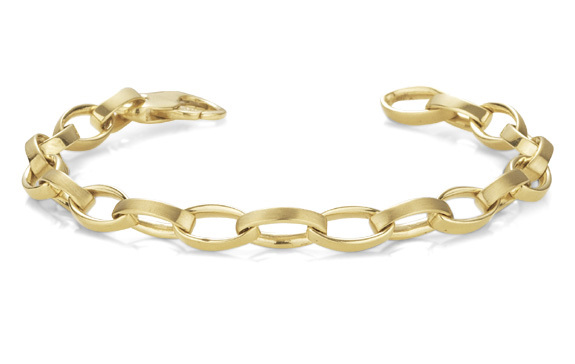 Gold bracelets for men are always in good taste. They add a polished touch to any man�s look and can be worn year after year without losing their appeal. Apples of Gold carries gold bracelets for men in a number of styles and a range of widths, providing statements of class that will fit the personal taste of any guy. Read more. 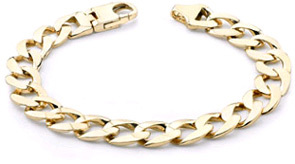 Gold curb chain bracelets are timeless choices that can give a pulled-together feel to any man�s look. These chains were originally used as part of horses� bridles because their links lay flat again one another, making them less likely to pinch a horse�s skin than many other kinds of chains. While curb chains are now chosen more often for their sleek good looks than for their skin-friendly properties, they remain both practical and upscale choices. Figaro chain bracelets are another upscale choice. With a name inspired by one of the operas of Rossini, it�s not a surprise that this style originated in Italy, nor is it a surprise that it emulates class. These bracelets alternate three round links with one oblong link, creating a look that�s interesting and always in style. In narrower widths, Figaro chain bracelets are subtly classy accents, while in wider widths, they emulate confidence and good taste. If you�d prefer a style inspired by life at sea, consider a mariner chain bracelet. These nautical designs resemble the chain that tethers an anchor to a boat as each oval-shaped link is bisected by a bar, creating a sturdy, masculine look that�s always a good pick. A mariner chain bracelet communicates that the wearer in anchored by class and controlled strength. In addition to traditional choices such as curb chains, Figaro chains and mariner chains, Apples of Gold�s collection of gold bracelets for men includes a number of unique contemporary designs, many of which are destined to become modern classics. From those that resemble a shining watchband to those that encircle the wrist with unusually-shaped links, there�s a piece to express any guy�s sense of style. No matter which you chose, you can be sure that you�re getting a piece that will last for the long haul. These pieces are crafted from solid 14K yellow gold�in other words, they�re not merely gold plated�making them pieces that can be worn year after year. 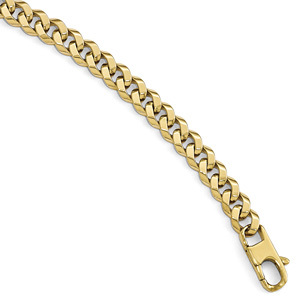 Gold bracelets for men from Apples of Gold aren�t just good looking: they�re investments.